I had some pretty wedding table sprinkles in my stash and thought they, along with some beads and pearls, would make a nice background for a couple of lovely die cuts my friend Linda sent me - thanks again Linda:) So the card came together fairly quickly once the glue I used for the sprinkles and beads had dried. This month's challenge over at Hero Arts is Fabulous Flowers so since there are flowers on the heart die and flowers in the sprinkles I'm submitting this card into the challenge. After making the card above I thought I'd try to make a more masculine looking Valentine using a favourite Hero Arts die and the inlaid die cutting technique. I'm submitting the cards into A Blog Named Hero's is A Bit of Sparkle Challenge and the Die Cut Diva's Love, Marriage and Anniversaries Challenge. 2 beauties, Heather! I must confess, though, that that first one has me swooning! How luxurious to have all those confetti pieces across the card! Beautifully done! Love how glittery your inlaid design is, too! Wow! Two gorgeous cards, Heather! WOW what a great entry for ABNH - love it! and all that wonderful confetti behind your pretty heart - have those dies so just might have to CASE your card! thanks for joining ABNH challenge! Just love your Valentine cards, Heather! The "girly" one is to die for - love all the sprinkles! 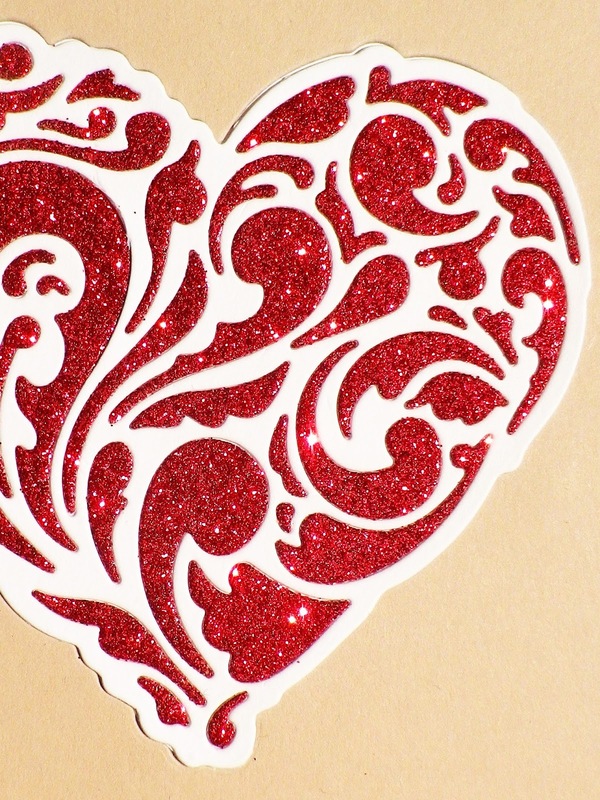 And Philip is sure to love the inlaid glittery heart card! That first card is simply amazing! Must have taken you forever to glue down all those sprinkles. but it was well the effort!!! Such beautiful cards...I adore the sequins in the first one...such a fun touch!